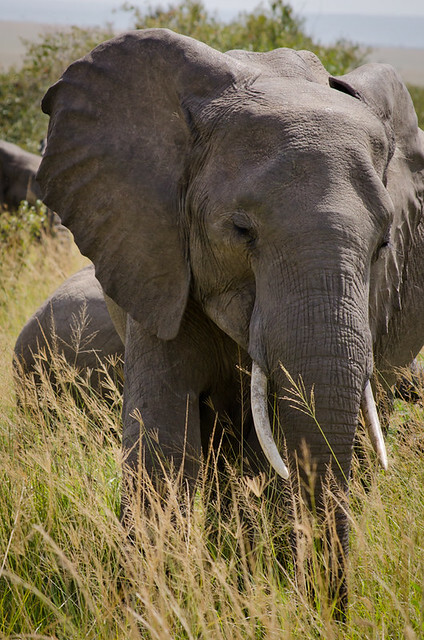 The Maasai Mara National Reserve (also spelled Masai Mara; known by the locals as The Mara) is a large game reserve in south-western Kenya, which is effectively the northern continuation of the Serengeti National Park in Tanzania. 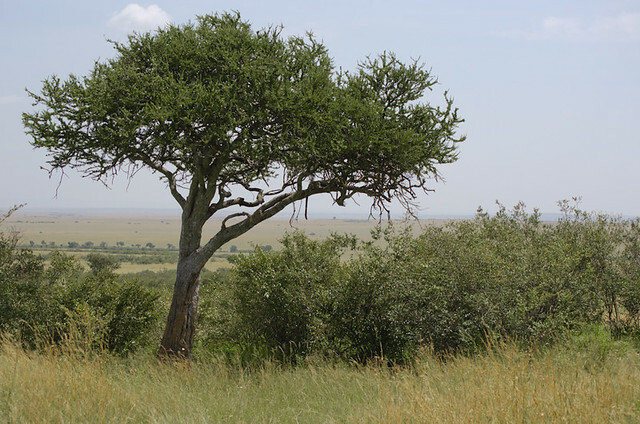 It is named after the Maasai people (the traditional inhabitants of the area) and their description of the area when looked at from afar: "Mara", which is Maa (Maasai language) for "spotted," an apt description for the circles of trees, scrub, savanna, and cloud shadows that mark the area. It is famous for its exceptional population of Big Cats, game, and the annual immense migration of zebra, Thomson's gazelle, and wildebeest from the Serengeti every year from July to October, known as the Great Migration. On our second day in the Mara, we spent the entire day in the park. According to our itinerary, we were supposed to get up early for the sunrise. However, after such a long day, none of us were that interested in waking up so early. We agreed to head out around 9 am. I was up earlier and could tell that the light would had been wonderful, but I was glad we didn't try to race the sun just for a couple of nice scenery shots. The likelihood we would have found any big cats on the prowl (which is the main goal for the sunrise excursions) were slim and the extra sleep was welcome. Once again, immediately after we entered the park we found zebras. 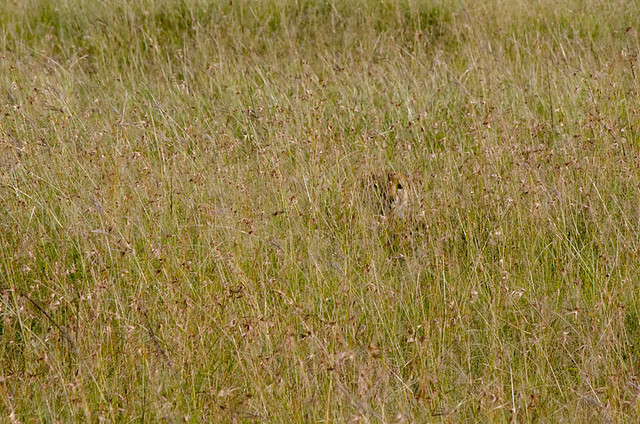 Next we spent a pretty lengthy time covering all the ground and peering into all the underbrush in an area where a cheetah was known to hang out, but luck was not on our side. Instead we drove further into the park, enjoying the scenery. One minute I would be looking out across the landscape at a sea of golden grasses leading up to distant hills, and the next minute someone in the van would call out [insert animal's name here] and point to a spot just to the left or right of where I was looking and I would discover an entire herd of antelope or a family of elephants. We had stopped close to one group of elephants, but I could tell our driver was a little antsy. He had something else in mind. As we approached the area, I wasn't quite sure what we were looking for. However, based on the number of tour vehicles lined up and grouped around, it was something exciting. At first, I was looking all over on the ground, in the bushes. 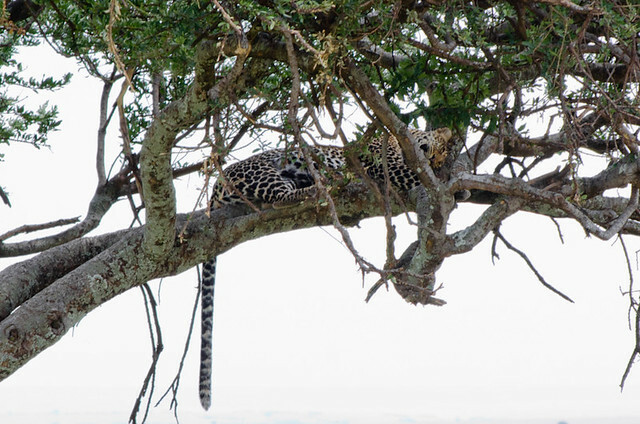 Then our driver said "leopard" and pointed up into the branches of the tree. And there he (she?) was, curled up in the branches, taking a nap. We staked out a space with the other tour vehicles and watched the cat nap for a while. When I wasn't watching the cat, I was watching the lenses. There were at least two vans of people with lenses like these, clearly getting better pictures of this leopard than I ever could. This van in particular was causing a little bit of a commotion. The driver had staked out the best spot and had no intention of moving. Unfortunately, the best spot also blocked the movements of other vans to and from the area where the leopard was and also kept other groups from viewing the leopard. There was a little horn honking, a little engine revving, and a little yelling as other drivers tried to maneuver around this van. After the leopard, we made a brief rest stop at the Keekorok Lodge located in the heart of the Mara. A lodge at which I could never afford to stay. A lodge where I even felt unworthy of using the restroom. Then we were off to find Tanzania. 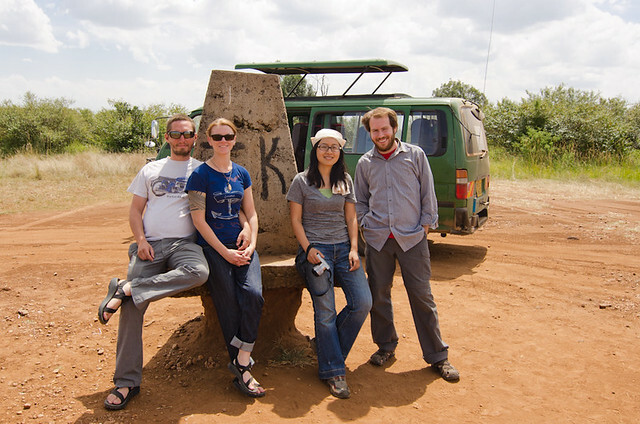 Us at the Kenya/Tanzania border. 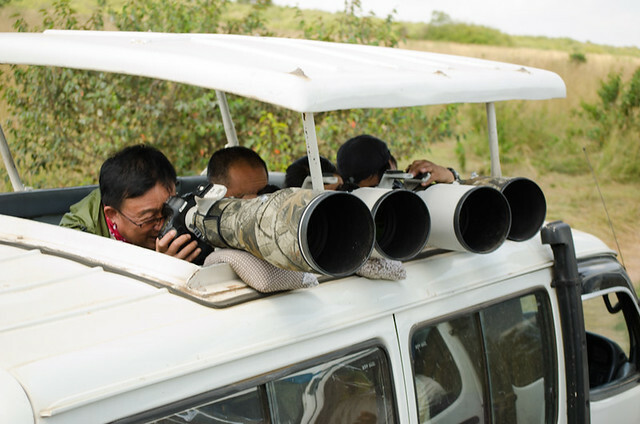 When you are in the Mara, you are not allowed out of your vehicle. There are many reasons for this rule, I am sure, however, the biggest reason is probably that it is bad for business when tourists are eaten by lions. I get the impression that the border is a common place for people to get out. Not far from the border, we took lunch at a spot by the river that is clearly the lunch spot. We were joined by some little friends who are quite fond of the lunch leftovers common here. 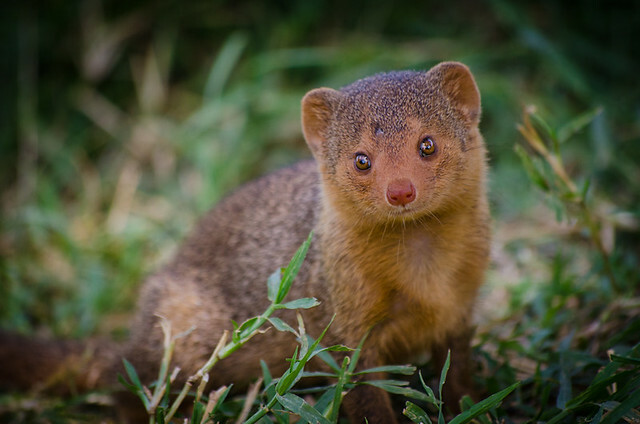 Of course, at least one of them was quite fond of digging around in the hippo poop too, so that doesn't say much about our lunch leftovers. Oh, did I say hippo poop? That this the true main attraction of the river. 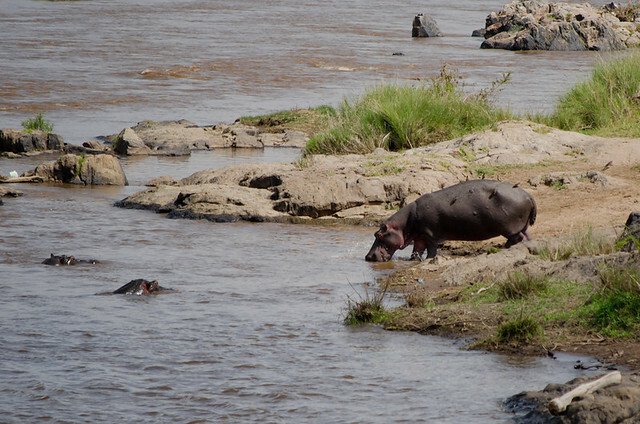 Not the poop, of course, the hippos. Just as we thought it was time to leave, we discovered we couldn't leave this spot without paying a man dressed in camo with a semi-automatic WWII-era rifle to give us a tour. And so we followed this man down to the river to look at more hippos and some crocodiles. After the hippos, we were heading on our way back to our camp when there was quite a bit of excited chatter on the CB. Our driver immediately diverted from the road home and started us on a long, circuitous journey into the hills. In the distance, we could see a herd of tour vehicles gathered on a side of a distant hill. We joined the pack and stared intently into the tall grasses. Hey, what exactly are we looking for here? Ah, a cheetah. But where is he? We asked a man in a nearby vehicle. He pointed into the grass, "its just there, in the grass." No matter how much I stared, I could not see anything. Clearly, camouflage works. Cale, however, was able to capture this image. Suddenly, one of the tour vehicles darted off the dirt road and into the grass, circling around to the other side of the cheetah. After a few minutes, the truck then took off at top speed leaving behind the pack. After we had left the area, our driver explained that the tour vehicles are not allowed off the dirt paths, so technically, all the vehicles that swung around for a look at the cheetah were breaking some rules.